3. 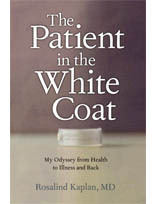 Here’s the main issue: This blog was set up in conjunction with the release of my book, ‘The Patient in the White Coat’ in 2010. Other than just getting out there and writing, I had no focus for the blog, and I wrote about a lot of different things. I started to feel like the world didn’t need one more person just yakking about this or that. So I am beginning a new blog. It’s called doctorswrite and the URL is doctorswrite.wordpress.com. So check it out. It’s focused on one of my great loves in life: Narrative Medicine. It’s basically stories about practicing medicine, comments about issues in medicine, and medical information hopefully presented in a fun and accessible way. Hope I’ll hear from you through doctorswrite!